StinkOps RVAP - a Tippmann M98 Rear Velocity Adjuster (RVA) with integrated shoulder stock clamp. We've always wondered why this part doesn't already exist: an RVA that lets you continue to use your existing or aftermarket M98 shoulder stock. Since it just didn't exist, we finally decided to produce them ourselves, and offer them as the next product in our Deadlywind StinkOps line. 1) It is an RVA. 3) Allows fast mount and removal of your M98 shoulder stock (or tail/strap plug, etc.) to your Tippmann M98 marker without having to split the entire body in half! 4) It removes ALL "slop" between the shoulder stock and the body. Because of our unique clamping method, it is more rigid than if you had your shoulder stock mounted directly into the body. - On a Tippmann marker, an RVA adds a way to adjust the hammer spring pressure to dial in your desired velocity. Many guns use this method to adjust velocity, such as the Autococker, Spyder, and most other spring/hammer style markers. Tippmann is one of the only companies that does not use this type of velocity adjustment. - Using an RVA instead of the side velocity adjustment screw on your Tippmann is advantageous because the side velocity screw actually blocks airflow to the paintball, thus wasting air power and decreasing efficiency. When you use an RVA, you can back the side velocity screw out farther and use the RVA to adjust velocity instead. This not only gives better gas efficiency (and more shots per tank), but also reduces kick due to the reduced hammer spring pressure. In addition, the reduced spring pressure makes the trigger easier to pull, and even makes the marker easier on paint. -Requires 3/32" Allen wrench for initial install, and a 5/32" Allen wrench for the clamping strap and velocity adjustment. 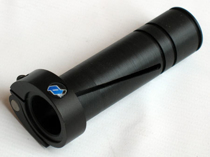 -Moves your shoulder stock back by 0.75", and is ACT compatible.